This course is for the novice user who has little or no experience with Microsoft Excel except for my Basic Level 1, 2, and 3 courses. Today's course is mostly about Charts & Graphs. We'll start by learning the basics of charting. What is a chart? What are the parts of a chart? We'll see how to create a simple column chart and insert it into our spreadsheet. Next, we'll learn how to add data to an existing chart, create a line chart, make a chart with multiple series of data, and work with chart styles and themes. You will learn how to select non-contiguous data (that's two ranges of data that aren't next to each other) so you can graph information that's in different areas of your sheet. You'll make a 3D pie chart and a 3D column chart. You'll see how to move the chart to a different sheet, change the chart layout, and the chart type. Next we'll learn how to switch the row and column axes, format all of the different objects inside of our chart (titles, axes, walls, etc. ), and insert comments, lines, shapes, and other objects inside the chart as well. You'll learn how to copy your charts to Microsoft Word to embed them inside of reports or other documents. You'll see how to create a summary sheet (also known as a dashboard). You'll learn how to separate a piece of pie from a pie chart, and create leader lines. 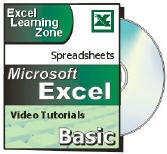 Finally, we'll learn how to create Data Tables which are database-like lists of information in Excel. You'll see how to use table styles to format them, how formulas work in series, how to use AutoFilter, and create a total row. Again, this is the perfect class for anyone who is new to Microsoft Excel 2007 and has finished my Basic Level 1, 2, and 3 courses. If you have little or no experience with spreadsheets, or you just want to get familiar with how Excel 2007 works, this class is for you.